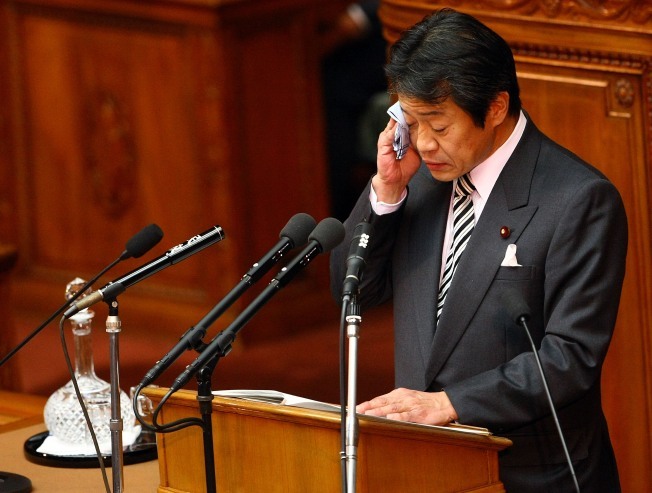 Japanese Finance Minister Shoichi Nakagawa has not yet publicly endorsed Purple Drank. Shoichi Nakagawa is the Britney Spears of global economics. As if any further insult needed to be added to the world banking crisis, Japan's finance minister resigned due to drunken antics more suited to a post-bender 9 a.m. Econ class at SUNY Stony Brook than the G7 summit. And he's generally spent the past few months acting the way you'd expect W would have acted as president if he'd never gotten sober. Then Nakagawa tried to excuse his behavior by saying he'd had some cough syrup. Which sounds about right, since he acted like he had gotten into some Purple Drank. If this is how the G7 operates, it explains an awful lot about the state of the economy. Now this guy has his very own recreational beverage, a sort of flip-side Red Bull and Vodka. The Drank, a mass-marketed street-legal version of the dangerous codeine-cough-syrup-based Purple Drank. And now he's got plenty of time in which to enjoy this barf-inducing heinously misguided tasty concoction.